Ok, so it's autumn but we're all still here. 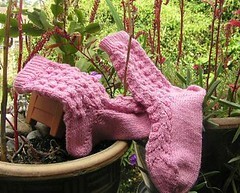 These are the Glad Ragg socks from Six Sock Knitalong. Very easy pattern to remember and the quick repeats make it easy to move along with the sock. Cleckheaton 5 ply machine washable crepe, pure wool.